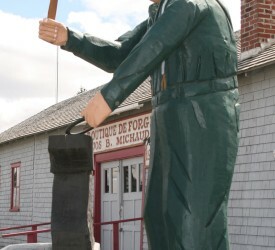 The “Musée de la Forge Jos B. Michaud” , Blacksmith Museum , is a renovated old blacksmith’s shop that kept its authenticity with over 100 years of existence. Nearly 1,500 artifacts are cataloged and preserved in their original place. The last owner was Jos B. Michaud, blacksmith and farrier who practiced his trade for 62 years, before that his father; Baptiste Michaud was the first builder and blacksmith for over 40 years.